Primitive melts produced beneath island arc volcanoes are rarely erupted at the surface in their original form, instead charting a huge variety of evolved compositions and testifying to the influence of intracrustal processing during magmatic ascent. The study of cumulates (coarse-grained igneous rocks) that sample directly from magma storage regions offers a chance to glimpse a ‘snapshot’ of this magmatic evolution. 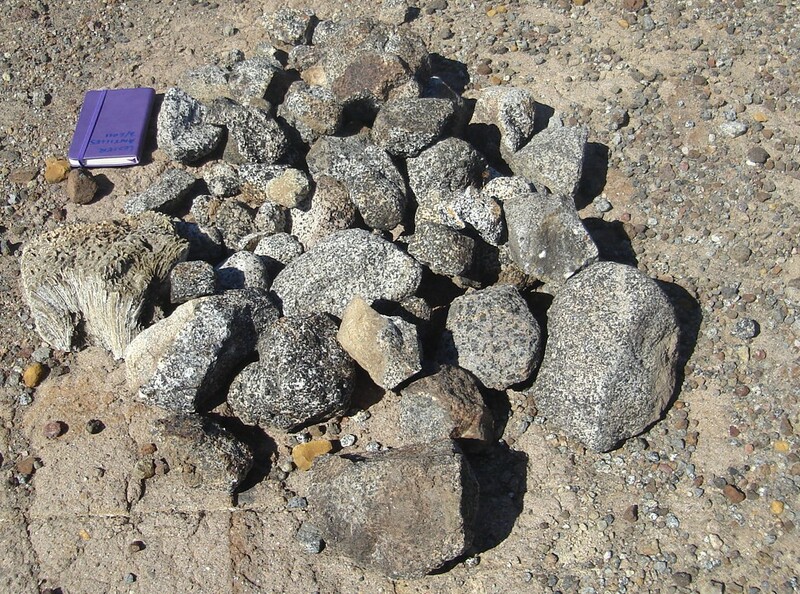 A new CRITMAG-funded study by Stamper and co-workers combines major element analysis of mineral compositions in plutonic xenoliths and volcanic rocks with data from previous experimental studies. The data is used to explore the differentiation of mantle-derived magmas beneath volcanic island of Grenada, Lesser Antilles. 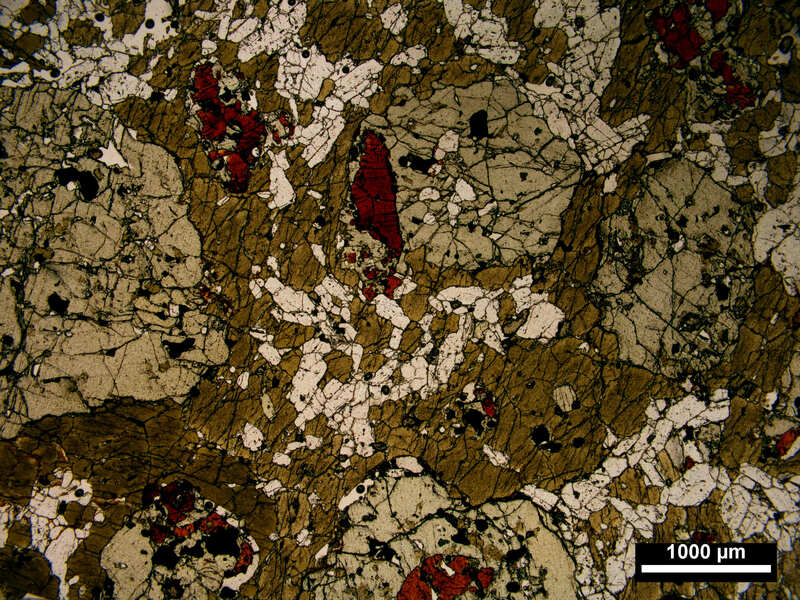 Photomicrograph (PPL) of poikilitic hornblende gabbro. Hornblende oikocrysts containing inclusions of clinopyroxene, spinel and iddingsitised olivine, with interstitial plagioclase. They find that observed diversity in cumulate assemblage and texture is caused by variability in parental melt composition and post-cumulus interaction with hydrous evolved melts. The whole plutonic suite is produced in a narrow pressure window (P = 0.2 – 0.5 GPa) at ∼ 850 – 1050◦C, tracing a shallow (depth ≤15km) section of a vertically extensive volcanic system. Major element barometers and experimental phase relations indicate that the source magma underwent equilibration with a garnet lherzolite source at depth of ≥55 km. Grenada cumulates are notably different from those found on the neighbouring island of St Vincent, which lies only 120 km to the north. At Grenada, lower magmatic H2O contents are manifest are in plagioclase-rich cumulates and aluminous spinels. The contrast in assemblages and mineral chemistry of cumulate xenoliths from the two islands demonstrate the effect of small scale changes in melt composition and magma storage conditions. Experimental petrologists at the University of Bristol conducted experiments on lavas from Grenada using a range of experimental apparata to simulate to pressures and temperatures found beneath the island arc volcano. The redox conditions of the experimental runs were measured using the Diamond Light Source synchrotron, UK, and spanned a wide range of oxygen fugacities. Synthetic replicas of natural rocks produced at moderately oxidising conditions were found to be comparable to the most primitive lavas erupted on Grenada. Stamper and co-workers were able to use the composition of olivine crystals produced in experiments to calibrate a novel oxybarometer, which uses the partitioning of Fe and Mg between liquid and crystals to measure the oxygen fugacity of an olivine-bearing basalt. Experiments from this study also resolve the origin of the geochemically and petrographically distinct M- and C-series lavas, the latter type being unique to Grenada. At high pressures, experimental liquids are able to track the geochemical evolution of the highly magnesian M-series. In contrast, at lower pressures, clinopyroxene saturation is displaced to lower temperatures, relative to olivine, and so residual melts generated at these conditions become enriched in calcium, replicating the characteristic feature of the C-series. Lava suites erupted from individual volcanic centres commonly exhibit a compositional ‘gap’ between basaltic and rhyolitic compositions, where the volume of intermediate eruptives is less than mafic and acidic equivalents. A study by Melekhova and co-workers explores the distribution of lava compositions erupted from crustal volcanoes, focusing on a case study from the volcanic island of St Vincent in the Lesser Antilles. 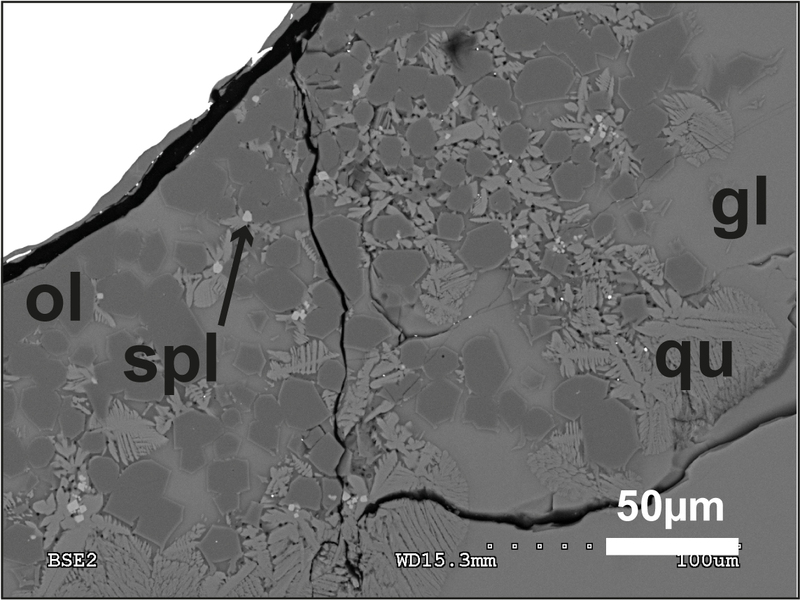 The crystallisation of cooling basaltic magmas was simulated using high pressure experiments, with synthetic run products analysed using a variety of microanalytical techniques. The authors discovered that variation in melt fraction (the amount of molten rock remaining in the model system) and melt composition with temperature is controlled by the composition of minerals crystallising from the parent magma. For example, a rapid decrease in melt fraction, and increase in melt SiO2, occurs when the minerals and melt have similar (eutectic-like) compositions, which is the case when little water is present. The experimentally determined phase relations were incorporated into a numerical model, which allowed enabled the team to explore the evolution of a magmatic system over time by simulating the incremental emplacement of small batches of magma beneath a volcano. When model results were compared with natural rocks from St Vincent, the best fit is produced by theoretical runs with water contents mirroring data from recently analysed melt inclusions, and heat content correlating well with the age of the island (~0.4 – 2.0 Ma). Furthermore, calculations show that the observed bimodality in erupted compositions is a natural consequence of the ‘damp’ nature of sub-arc melts. Although Melekhova et al.’s approach focused on an oceanic island arc volcano, it offers insights into other types of volcanic system; because magmas produced from a given basalt exhibit tractable changes in composition with time, they can be compared to lavas from any igneous terrains where there are good temporal constraints on changing magma (or melt inclusion) chemistry. Coarse-grained igneous rocks, sourced directly from a sub-volcanic magma chamber, provide glimpses into the prevailing conditions beneath an active volcano. Tollan and co-workers used several different techniques to analyse the major and isotopic composition of mineral phases in cumulates sourced from the active volcanic island of St Vincent in the Lesser Antilles. Cumulates are igneous rocks comprise the first fractionating minerals that form from a crystallising melt. The combinations of minerals and their composition are modulated by the conditions imposed upon the magma when it is cooling, and thus each rock represents a unique ‘snapshots’ of magmatic evolution. The study revealed that the rounded cumulate nodules are distinctively rich in anorthitic plagioclase and pargasitic hornblende, accompanied by fresh olivine and pyroxenes. The composition of the minerals indicates the cumulates formed at ~970 – 1150°C at 5-6 km below the Earth’s surface. Cumulate xenoliths on the island of Bequia, Lesser Antilles. The paper concludes that all the cumulates collected from St Vincent formed from relatively evolved melts rich in calcium, aluminium and water. These types of magmas are produced from early crystallisation of mafic phases (olivine, clinopyroxene and Cr-rich spinel) before their low density facilitates ascent through the crust, where they stall and deposit the observed cumulus minerals in shallow magma chambers. Evidence from oxygen isotopes suggests the cumulates have a residence time of ~50,000 years before being entrained and fragmented by newly injected magmas, and transported to the surface during explosive volcanic eruptions.